I'm having some troubles with installing Third Pary Licensing & Activation Toolkit in LabVIEW 2014 SP1 (64-bit) on my PC. This package requires administrative privileges to install. Please restart VIPM and LabVIEW as an Administrator to continue installation. I am able to install the package on LabVIEW 2012 SP1 (32-bit). Any suggestions? Does the toolkit support LV 64-bit? Thank you for bringing this to our attention. TPLAT is supported in LabVIEW 64-bit, however there is a bug in the VI Package causing the error on 64-bit installations. The package has a pre-install action that checks write access to a protected folder. The folder it is supposed to be checking is "C:\Program Files (x86)\National Instruments\_Legal Information" however the installer is inproperly attempting to write to "C:\Program Files\National Instruments\_Legal Information" which does not normally exist. Since the folder doesn't exist, the pre-install action is throwing an error. 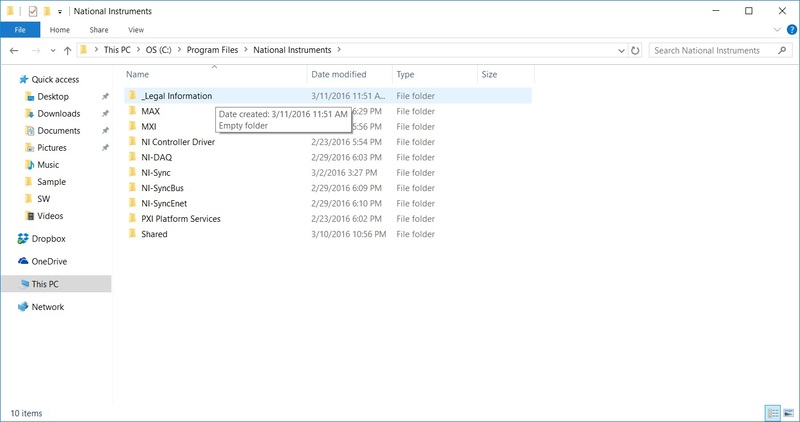 The workaround is to simply create an empty folder at the location "C:\Program Files\National Instruments\_Legal Information" and re-attempt installation. I'll report this to R&D so this hopefully can be resolved in the next package update. Thanks again, and please let me know if you still have trouble after trying my workaround. The workaround didn't work in my case. I'm using LV2015SP1 32-bit in W10. 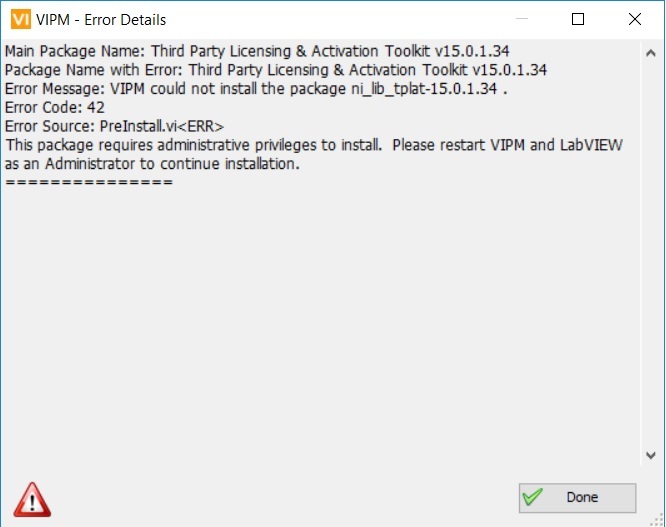 What error is reported by VI Package Manager during installation? There's only one user account in this laptop, mine as admin. Despite having admin rights for your user account, you still need to choose to run applications with admin rights enabled in Windows. Microsoft introduced this behavior in Windows Vista to protect users. It is somewhat common to now need to elevate permissions when installing software either by running the installer as an Admin or via a UAC prompt during installation. Please right-click on the VI Package Manager EXE/shortcut and choose to 'Run as Administrator' prior to installing the TPLAT package and I'll bet you won't see Error 42. I'm glad I didn't bet !! No problem. Glad you're up & running!